When the seasons start to change, your yard is going to require a bit more work than usual. From pulling weeds to pruning trees and hedges, there’s a lot of work you need to get through in order to have your garden ready for use. However, in order to reach every corner of your garden, you need the best pole hedge trimmer in order to get the job done. WHAT IS A POLE HEDGE TRIMMER? When keeping your hedges and shrubs nice and tidy, shears and clippers can be cumbersome. Hedge trimmers, on the other hand, offer you the convenience of a motorized tool that can quickly neaten up your edges in a way that requires little effort from you. However, some hedges can be quite tall, and reaching them can be difficult and stressful. A pole hedge trimmer takes all of the versatility of a hedge trimmer and adds an extendable pole that enables you to reach places you couldn’t reach before. Rather than use a ladder to get to the top of your hedges, a pole trimmer lets you tidy up the tops of your hedges in a safe and easy manner. Not only that, but they can allow you to get in behind shrubs and other difficult places like beside fences and walls. 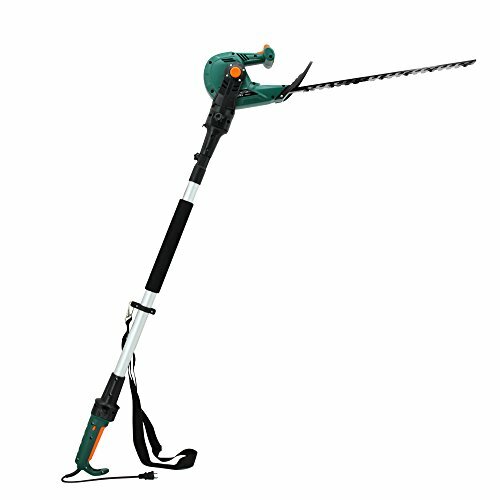 The Greenworks Pole Hedge Trimmer is a 40V cordless model that allows you to trim your hedges with ease, thanks to the extendable length and pivot head that the unit features. Designed to make your yard work a breeze, this model is the perfect tool for large yards and people who love to spend time outside. It’s important when you are working in your garden that your gear doesn’t weigh you down. The Greenworks hedge trimmer is a very lightweight model, which allows you to work without fatigue. Thanks to the minimal effort required to wield the trimmer, it is suitable for adults young and old. The Greenworks hedge trimmer gives you the flexibility to be able to trim any hedge type. With its 8-position pivoting head, you’ll be able to reach the out of the way places at the tops, bottoms, and backs of your hedges. Not only that, but the head is fully extendable to over 6 feet, so you’ll be able to reach any part of your hedge. The worst thing that can happen when you are performing your routine yard maintenance is a breakdown of equipment or a lack of battery power to see you through your entire task. Thankfully, the Greenworks cordless hedge trimmer features a 40V battery with up to 350 yards of battery power. This means you can get through everything you need to do without recharging. Black+Decker is one of the most trusted names in power tools, so it comes as no surprise that their pole hedge trimmer delivers a powerful and easy hedge trimming experience. 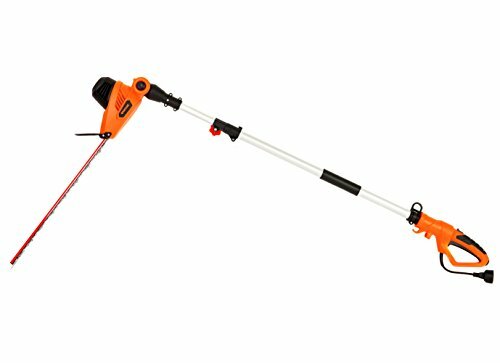 A small and lightweight model, this hedge trimmer will allow you to quickly power through your trimming jobs so you can get to relaxing. It can be tiring using a hedge trimmer for an extended period of time because the vibration you feel from the motor can induce fatigue and muscle strain. The Black+Decker hedge trimmer allows you to trim your hedges with a 40 percent reduction in vibration when compared to other hedge trimmers, so that you can work with less breaks. With an ability to pivot a full 180 degrees, this model has a 5 position adjustable design so that you can customize your trimming experience. Not only does this make it easier for you to get the job done, but you’ll be able to trim more precisely, making your hedges look great. A lot of cordless yard tools feature NiCad batteries which, while performing well, don’t tend to last very long. The Black+Decker model features a lithium ion battery which is able to last for five times longer than your other yard tools. 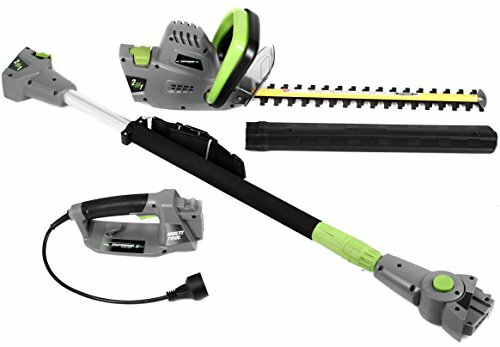 The GARCARE 2 in 1 hedge trimmer works as both a pole and a portable trimmer and comes packed with features that make your yard work easier. With a laser cut diamond grinded blade and superior reach, there’s no doubt that you’ll power through everything you need to do quickly. 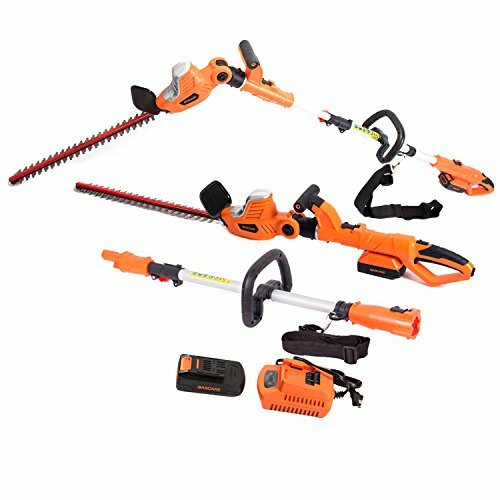 Not only does the GARCARE hedge trimmer feature a fully adjustable 6 position pivoting head, but it also has a 5 position rotary rear handle. This allows you to use the trimmer at practically any angle, allowing you to reach any range that you desire. 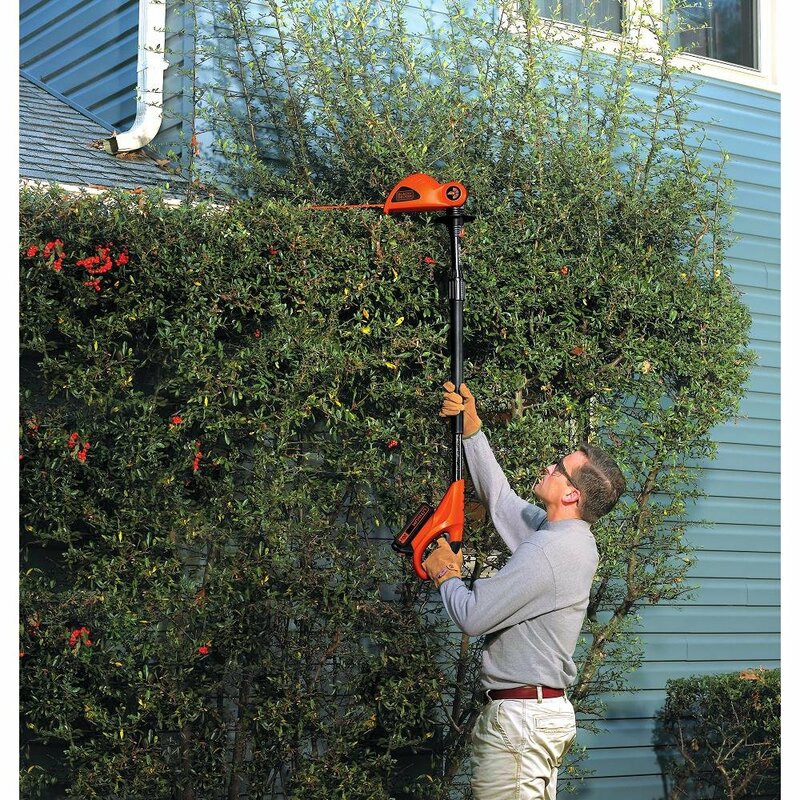 The pole hedge trimmer is able to extend to over 9 feet long. This is far longer than most other hedge trimmers, as the typical extension length is around 6 feet. Not only does this allow you to reach the tallest of your hedges but it reduces the strain on your arms as you don’t have to reach. When you’re trying to work quickly but your battery runs out half way through, it can set you back hours as you wait for it to recharge. The GARCARE features a super quick one hour recharging battery which means that you can get back to it sooner. There’s a lot to be said for the power and convenience that a corded pole hedge trimmer can bring you, and the Earthwise model doesn’t disappoint. Converting from a regular hedge trimmer to a pole trimmer, you have flexibility and versatility in one design. When you have very tall hedges, you need a lot of reaches. The Earthwise model is able to extend to 8 feet, which gives you up to 13 feet of overhead reach in total. The handy shoulder strap allows you to hold the trimmer comfortably as you trim those hard to reach places. The head of this pole trimmer rotates from -20 to 60 degrees so you can tailor your cutting angle to the job you’re doing. Not only that, but it has five preset positions that make it easier for you to perform precise trimming. Some people might think that cordless models are the most convenient for hedge trimming, but corded models allow you to trim for much longer without worrying about the battery running out. Rather than spending your time charging, you can just get on with the job. Sometimes all you need is simplicity in order to get the job done. The DOEWORKS 3 in 1 hedge trimmer is a perfect example of how a tool can meet a need without being overwhelmed with confusing features. The DOEWORKS 3 in 1 hedge trimmer offers you the freedom to trim back everything in your yard, be it a hedge, shrub or tree. With an easy conversion between the three formats, there is no need for any extra tool to keep your garden looking great. DOEWORKS have made a real effort to create a strong, sturdy hedge trimmer. With rust-resistant steel on the blade to the aluminum telescopic extender in the arm, you can be sure that this model will be tough enough to withstand any amount of work you need to do. Though slightly heavier than most trimmers, the DOEWORKS hedge trimmer features a soft rubber grip so that it feels comfortable to hold. The rear handle is also fitted with a rotary design that will reduce the stress on your wrists while you work. We’ve already established that DOEWORKS is a worthy addition to our list, but they continue to one up themselves with this cordless 40V hedge trimmer. Not only does it free you from the need to have an electrical outlet, but it comes with everything you need to make gardening simple. Corded models are great when you don’t want to worry about having to recharge your battery, but one step even better is having a hedge trimmer with a lithium ion battery. The 40V battery in the DOEWORKS cordless model allows up to five times longer usage than traditional batteries. Not only is this model a great pole hedge trimmer, but it easily converts into a handheld hedge trimmer so that you can work on everything at once without changing tools. This also saves you money as you don’t need to buy any additional tools. DOEWORKS are known for creating quality garden tools and the 2 in 1 cordless model is no different. You’ll find the same rotating head, sturdy construction and comfortable grip that you have come to expect from the brand. If you want power, then you won’t get much better than the GARCARE 4.8-Amp hedge trimmer. 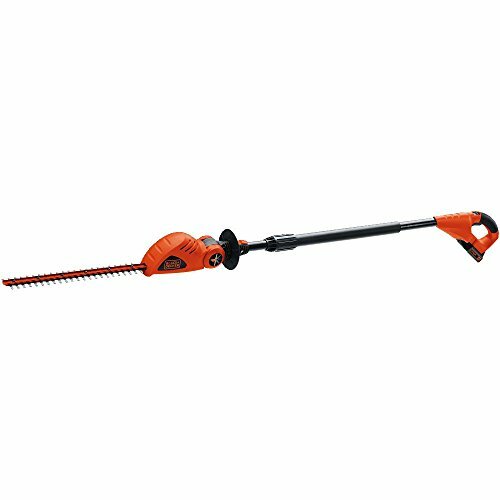 While it is a corded model, this allows you to cut through any hedge or shrubbery without worrying about resistance. The pole on this hedge trimmer sits at 7.2 feet long, but extends and locks in at 9.2 feet when you require that extra height. This not only helpful for reaching the tops of your hedges, but it also gives you the ability to reach behind your bushes without discomfort. The rotating head on this model allows you to cut and trim your hedges, shrubs and trees at any angle. Combined with the extended reach, there’s not a single place you won’t be able to prune in your garden. Thanks to the high power rating on this hedge trimmer you have the ability to power through the toughest of branches. The 20 inch laser cut steel allows you to slice through ¾-inch branches with ease. Maintaining clean cut edges to your hedges and shrubs doesn’t need to be hard. The Sun Joe pole hedge trimmer is designed to make life easier for you by offering you an innovative, powerful tool to get you through your garden work. The telescoping pole that extends the trimmer on the Sun Joe model gives you an impressive reach of 13 feet. Not only does this remove the requirement for a ladder, but you’ll be able to reach everything you need to safely and efficiently. In order for you to get into those difficult to reach places underneath your shrubs and above your hedges, Sun Joe have designed their pole hedge trimmer to pivot and rotate as you need it to. There are five preset adjustable settings for you to choose from. While many hedge trimmers focus on usability, the Sun Joe model goes one further by allowing you to choose from several different colors. You can coordinate your new hedge trimmer with your other tools and choose from green, gray and red. While Sun Joe has demonstrated an innovative design in the previous item on this list, this particular model extends that functionality by featuring a convertible design. Not only can you reach everything you need to with the extendable pole, but you can also trim your hedges with the handheld format at the click of a button. If you thought the previous model was powerful, you’ll be surprised to find out that this particular model comes in at a whopping 4.5-amps. That means that you can experience a higher level of power that will allow you to cut through any branch like it was made from butter. You don’t have to spend extra money or waste time swapping tools if you want to go from your pole trimmer to a handheld format. Now, you can quickly convert from one to the other in one tool. Taking only seconds, you will save valuable time in the garden. Not all hedge trimmers focus on giving you a powerful cutting experience whilst reducing the vibration you feel through the unit, but this model takes that into account. With up to 40% less vibration, you’ll experience reduced fatigue while you’re working. 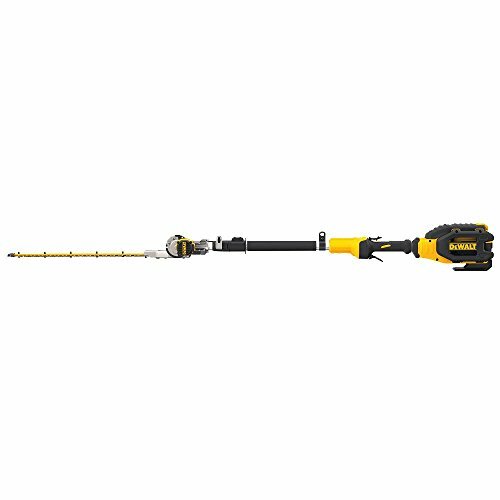 Last but not least, the DEWALT pole hedge trimmer is a powerful and versatile model. 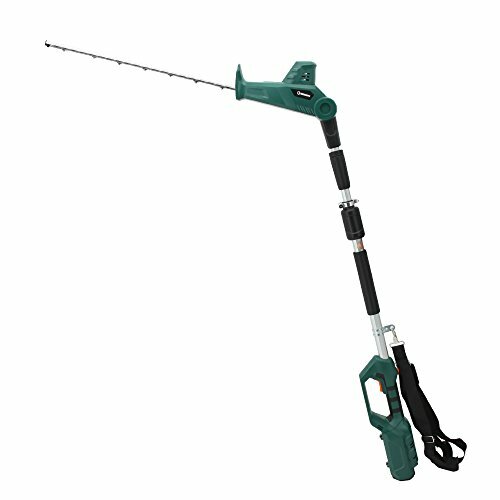 While other pole trimmers focus on extended reach, this model is unique because it is robust enough to use in compact spaces as well as for tall overhead hedges. Your garden is full of many different shrubs and hedges, and you need a hedge trimmer that can cut in any position. Rather than be limited to just a few adjustable positions, this trimmer has 8 positions that you can choose from, so that you can cut at any angle. If your relationship with your neighbors is important to you, then this hedge trimmer will allow you to work without annoying them with loud noise all weekend. Your ears will also thank you, as you’ll be protecting them from the damage that comes with loud tools. Rather than focus on how long this pole hedge trimmer extends to, it’s important to know that this model will also retract to a tiny 45 inches, so that you can get into compact spaces a lot easier. When you require the additional reach, it will extend to 70 inches. HOW TO USE A POLE HEDGE TRIMMER? Using a pole hedge trimmer is pretty simple, however, the way you use the trimmer depends on the type of hedge you have. For formative trimming, you will want to trim your hedge soon after planting it in order to give it the shape you want it to grow into. For maintenance after your hedge has already been shaped, use your pole trimmer to trim the edges of the hedge frequently so that the shape is maintained. Be sure to check that there are no nesting birds in your hedge, and if you have a flowering hedge, wait until after the flowers have grown to perform your maintenance trim. Use your pole hedge trimmer by extending it to the position that suits the height that you’re trimming at. Depending on the model of trimmer you have, you will have to press one or more levers in order to start the blade while you trim. Your pole hedge trimmer will adjust so that you can trim the tops, sides and bottom of your hedge with ease. In order to be safe when using your pole hedge trimmer, there are a number of precautions you should take. Here, we outline the most important safety precautions that you need to keep in mind. When you use power tools, there’s a chance that something unexpected might happen. While trimming your hedges, you are at risk of snagging yourself on sharply cut branches, or having a piece of wood fly into your eye. Be sure to wear protective clothing, eyewear, a helmet and proper footwear. Trimming your hedge in the rain is a bad idea. Not only will the water interfere with what you’re doing, yielding unexpected results, but the water could cause a safety risk when you use electrical equipment. If your kids are running around underfoot, they are at risk of being hit by any flying debris. While unlikely, this could cause massive injury to tiny bodies, so it is best to put them inside until you’re done and cleaned up. This goes for pets, too! If you try to trim your hedge while there are loose branches and other debris within it, you are risking the chance of this debris flying out and causing harm when it hits you. Spend some time making sure the area is clear before you start to avoid this issue. Leaving your hedges to grow out can lead to a wild and unruly garden. Rather than let it grow, trimming it can keep it healthy and looking great. By trimming, you are encouraging new growth within your hedge, which makes more a more vibrant and colorful garden. Keeping your hedges and plants trimmed can also increase the value of your home. Beautifully landscaped gardens are a key design feature in catching the eye of a potential buyer, and if you have a wild, overgrown garden this can turn them off before they’ve even seen the house. Keeping your hedges healthy will also give you a sense of privacy. As your hedge will be healthy and thick, this will reduce the ability for neighbors and passers-by to take a nosy look into your house and yard. It’s not just the aesthetic value that is increased by keeping your hedges trimmed and tidy. You’ll also find that you increase the management of pests that you have hanging around your home, as trees and hedges are haven for the worms and insects that can cause damage to your garden. To get the most out of your new pole hedge trimmer, we’ve put together some handy tips and tricks for using and maintaining your new trimmer. In order to save time cleaning, later on, put a sheet down on the grass before you start trimming your hedge. This way you can collect the cuttings as they fall, and cleaning them up is as simple as picking them up and composting them afterward. As you cut your hedges, twigs and debris will gather between the teeth of the blade, and if these build up, it will affect the performance of your hedge trimmer. The best way to keep it in great shape is to clear this debris as you’re using the trimmer. Most pole hedge trimmers will come with maintenance instructions in the owner’s manual. These instructions should tell you step by step how to maintain your trimmer to keep it in good shape. Petroleum trimmers may require you to use an oil on the blade, while electric trimmers may not need a lot of work. In any case, if your trimmer is looking worse for wear, have a professional give it a service. If you’re not seeing the cutting power you’re used to, then you can sharpen the blades. To do this, release the blade from the unit and fix it in place using a vice. Use a metal filer to sharpen the teeth by sliding it along the blade at an angle for the length of the blade. Do not use your finger to test the sharpness – instead, use a piece of paper to make sure it is sharp. Pole hedge trimmers come packed with many features, but there are a few important decisions you must make before you pick the perfect hedge trimmer for your needs. If you want freedom of movement around your garden, then a cordless model is an attractive solution for you. However, as these are powered by batteries, you will find that they are underpowered when compared to the corded varieties. 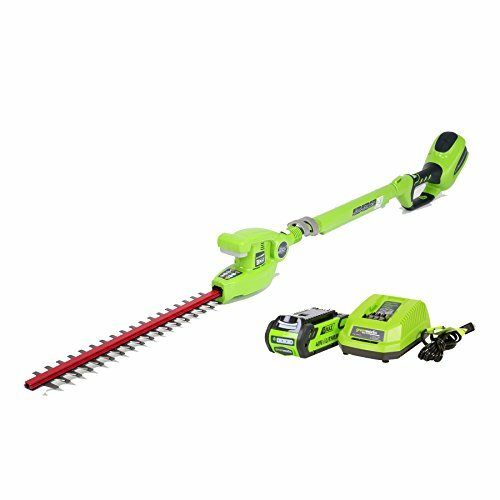 If you can live with long cables stretching across your yard as you work, then a corded model might be the best way to get a good powered hedge trimmer. The blade of your hedge trimmer will have teeth either on one side of the blade, or both. Depending on your needs, you’ll have to choose which one to pick. Single sided blades are great if you want to trim primarily straight sections of hedge, whereas double sided blades allow you to trim more complex shapes. The way the head of your trimmer moves will dictate how much flexibility you have when trimming different areas of your hedge. While some places might be easy to reach with your fixed head, moving on to an angled section may require repositioning yourself. A pivoting head can get around this by allowing you to angle the hedge trimmer any way you need it. In order to reach your entire hedge, you need to make sure you have an appropriate blade length. If your hedge is very wide, then having a blade that is less than half the width of it means that you’ll end up with a section that you can’t reach, making it look messy. 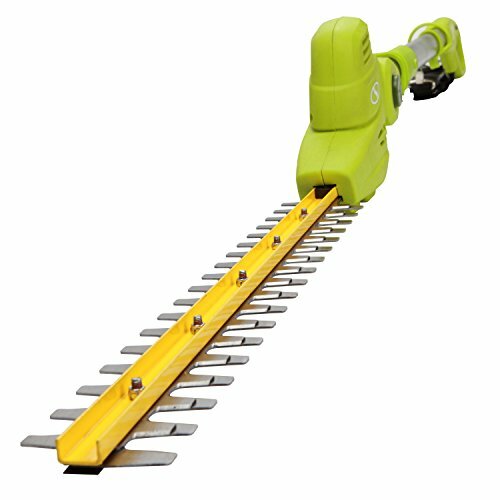 Trimming hedges all day can be really uncomfortable and if you feel that you might get tired easily, you should look for a trimmer that has added comfort features. Things like rubber handle grips and reduced vibration will go a long way in making sure you’re comfortable and free from strain as you work. Q: What happens if the hedge is uneven as I trim? A: An uneven cut can be a sign that the blade on your pole hedge trimmer is not affixed tightly or that it may be starting to become blunt. Try sharpening the blade to increase performance. Q: Why does the blade keep stopping when I trim? A: Each hedge trimmer is rated to cut branches of a particular size. If you trim branches that are too big for your trimmer to handle, then it will stop. Q: Is it difficult to start an electric hedge trimmer? A: You are probably asking this because you’re used to fuel based trimmers that can take effort to start. Electric trimmers are easy to start and you only need to press a button to turn it on. Q: How high can you cut? A: This depends on the model of hedge trimmer that you buy, but you can usually reach between 8 and 13 feet with an extendable pole hedge trimmer. Q: Can you use a pole hedge trimmer as a weed whacker? A: You certainly can provided the head pivots to a 90 degree angle. Not all trimmers can do this so check the specifications before you buy. 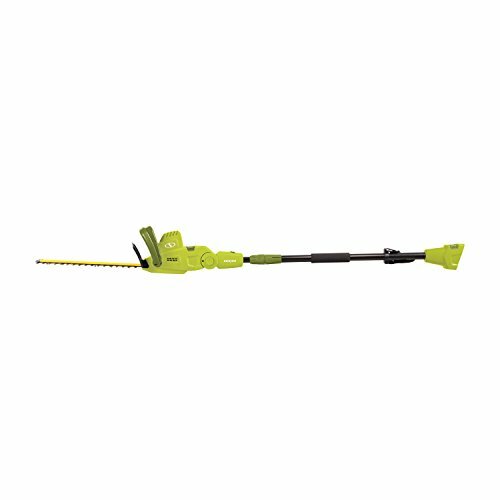 Our favorite is the Greenworks 40V cordless pole hedge trimmer. Not only is it a cordless model with a battery that boasts amazing longevity, but it has one of the widest varieties of pivoting adjustment modes that we’ve seen on this list. We believe that this model will allow the most flexibility and versatility when trimming hedges and shrubs. Rather than spending your weekends trimming your garden by hand, a pole hedge trimmer can save you time whilst allowing you to reach places you couldn’t before.